I hope everyone is having a Merry Christmas. If you're in the Fort Worth area, then you know that we are having a rare White Christmas this year. We went from 70 degree weather on Wednesday to snow on Thursday. 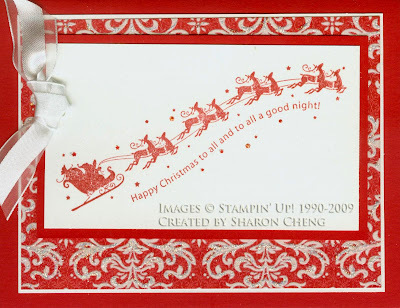 For stamp club, I designed this card that could easily be a Christmas or Valentine's Day card depending on which stamp you used. 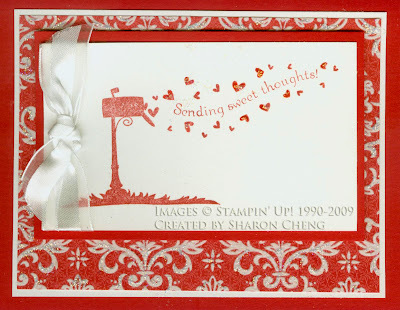 As the Holiday mini catalog ends on January 4th, I wanted to use both the Wandering Words stamp set and Christmas Cocoa paper. Two of the papers in the set are flocked. I love how this paper looks with just the flocking or when you add glitter. The good news is that the Christmas Cocoa paper is available as a download for My Digital Studio. While the paper won't be flocked, the designs will be still be available.